Acid reflux is also known as gastroesophageal reflux disease, or GERD. Gastro refers to the stomach and esophageal has to do with the esophagus, the tube through which food passes to reach the stomach. The definition of reflux is the flowing back of a liquid, in this case stomach contents that may be regurgitated or vomited. In acid reflux, the liquid, including digestive acids, that are contained in the stomach flow back up into the esophagus creating the uncomfortable burning sensation known as heartburn. When acid reflux symptoms occur more than twice a week, you may have acid reflux disease, or GERD, and will probably need to research diets, cures, treatments, home remedies, and foods to avoid in order learning how to prevent acid reflux. 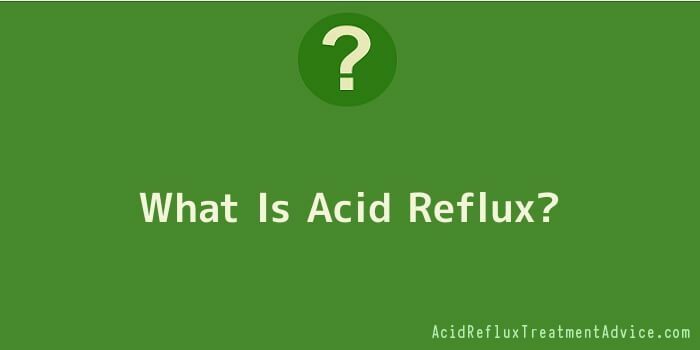 However, before you dive into the remedies, it is important for you to figure out, “What is Acid Reflux?”What Is Acid Reflux? Between the stomach and the esophagus is a ring of muscles called the lower esophageal sphincters (LES). In normal digestion, these muscles open to allow food into the stomach and close to prevent acids and other liquids from backing up into the esophagus. When these muscles don’t operate properly or fail to close completely, stomach liquids escape into the esophagus causing irritation and discomfort. Overtime, stomach acids in the esophagus can lead to medical issues and conditions, or simply cause acid reflux and could require surgery. A common cause of acid reflux is a hiatal hernia, a stomach abnormality that causes the LES and stomach to move above the diaphragm, allowing stomach acid to move up into the esophagus and irritate your throat, causing acid reflux or heartburn. However, beyond medical conditions like a hernia, certain foods we eat cause acid reflux as well, including tomato, chocolate, citrus, mint, garlic, onions, spicy or fatty foods. People suffering from acid reflux should avoid eating large meals, overeating, lying on your back after eating, snacking right before sleeping, smoking, taking aspirin or ibuprofen, or drinking certain beverages, like alcohol, coffee, tea, and carbonated drinks, especially soft drinks. Nearly everyone has experienced heartburn, but people who experience it more than twice a week for more than a two week period are advised to see their doctor since the most common symptom of acid reflux is frequent heartburn, and they may have acid reflux disease. Heartburn is a burning or discomforting pain coming from your stomach into your abdomen, chest, or even throat, usually caused after eating certain foods. Other common symptoms of acid reflux include dyspepsia, a general stomach discomfort which may be accompanied by gas, hiccups or regurgitation, and dysphaglia, the feeling that something is stuck in the esophagus. Additionally, bloating, sore throat, dry cough, burping, and nausea, especially in the morning, may be symptoms of acid reflux. Occasional acid reflux is experienced by most people and is extremely common among pregnant women. In fact, acid reflux is one of the most commonly reported digestive complaints. Most adults can manage symptoms by avoiding foods that cause heartburn and by taking antacids, such Alka-Seltzer, Rolaids, Maalox, Mylanta, or Riopan, to neutralize stomach acid or medications to reduce the production of stomach acid. However, beware of overusing antacids as they may cause diarrhoea or constipation. If these steps do not cause symptoms to abate, people who suffer from acid reflux regularly should consult a doctor. As a rule, acid reflux is not a serious condition in spite of the pain and discomfort it causes. Failure to treat the symptoms of acid reflux can result in complications with more serious implications. The most common complications are Barrett’s esophagus, a precancerous condition of the lining of the esophagus and esophageal stricture, a narrowing of the tube due to scarring caused by repeated exposure to stomach acid. An endoscopy is required to diagnose these conditions. Generally, acid reflux remedies come in the form or either capsules, pills or solutions. But what is important is that if you are someone who is already suffering from acid reflux and is being treated by their doctor, and then you should discuss the issues with your doctor as to whether you can consume the herbal remedies together with what your doctor has prescribed. The main reason why these remedies have become so popular today is that they contain only natural ingredients and the chances of them causing any kind of side effects (compared to prescribed medications) are very few if any at all. They are, especially effective for treating infants and young children when it is sometimes very difficult to actually provide a diagnosis that they are suffering from acid reflux. However, for adults the best way to treat acid reflux naturally is by making changes to your lifestyle and the kinds of foods that you consume. So, you should start to decrease or eliminate the amount of alcohol you drink and if you smoke you should try to quit. Prilosec is available both ways. If you only suffer from heartburn, you can do short-term management with OTC (over the counter) Prilosec. If you suffer from stomach ulcers, then your doctor can prescribe a stronger version for you. Protonix is available by prescription only and is highly effective. Results show acid reduction of around 90% in patients studied. One of the oldest of the acid reflux drugs, this is available both OTC and by prescription. Zantac is used to prevent acid reflux and to help heal esophagitis caused by acid reflux. While there isn’t necessarily a cure for acid reflux, with a combination of lifestyle changes and/or medications, you can be relatively symptom free. Summary: Acid reflux is a common digestive disorder that is exacerbated by the foods we eat or drink pregnancy, obesity and smoking. The back-up of stomach fluids into the esophagus causes pain and a burning sensation along with generalized digestive discomfort, including a burning pain known as heartburn. Failure to treat the symptoms of acid reflux can result in complications that may require acid reflux surgery, so individuals who suffer from frequent heartburn are advised to change their lifestyles and avoid certain foods, or seek medical advice. After learning more about what is acid reflux, you should have a better idea of the causes, symptoms, diets, and treatments required to help remedy acid reflux. Acid reflux or GERD (Gastroesophageal Reflux) is a medical term used to describe a condition where food and stomach acid back up into the esophagus. At the bottom of the esophagus is a ring of muscles called the lower esophageal sphincter (LES). The LES opens and closes to allow food to enter the stomach. After meals, the LES opens to release gas. However, more than just gas may escape. Stomach contents may flow back into the esophagus and out the mouth. What parents see is the infant spitting up, vomiting can also occur. Acid reflux can occur during or after a feeding. It can also occur when babies cough or cry as well. Acid reflux occurs in the first three months of age in more than half of all infants. It is quite common and is generally called ‘spitting up’. However, most babies do not need treatment. Acid reflux symptoms usually disappear between 12 to 18 months of age. For a very small number of babies the symptoms can be quite severe. In these cases, medical treatment is required. Sometimes, your doctor may make a diagnosis of acid reflux based on a parent’s description of symptoms and feeding history and a physical exam even if your baby is healthy and growing well. If your baby’s doctor suspects a more serious condition, such as GERD they may order more tests. These tests may include esophageal pH monitoring which measures the acidity in your baby’s esophagus. Another test is an Upper endoscopy. This is where a tube with a camera lens and light is inserted through the baby’s mouth and into the esophagus and stomach. The doctor uses this procedure to see if there is a narrowing or inflammation in the esophagus. For most babies, acid reflux will disappear during the first year of life. It is extremely important to discuss the treatment options with your baby’s doctor before beginning any treatment method, especially before using any over-the-counter medicine.